Busy traffic around Stonehenge has put the prehistoric monument on a list of the most threatened wonders of the world, according to Wanderlust magazine. 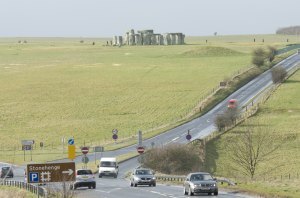 The Government has decided to abandon a plan to bury the roads around Stonehenge, including the busy A303 and A344 junctions, in an underground tunnel because of cost concerns. It has also decided not to establish a permanent visitor centre at the site, instead pledging to create a simpler and cheaper visitor centre a mile away in time for London’s 2012 Olympics. Liz Hughes, editor-in-chief of Wanderlust, said Stonehenge was ‘brutally divorced from its context’ by the surrounding roads, adding: ‘Seeing it without its surrounding landscape is to experience only a fraction of this historical wonder. Other wonders of the world in danger, according to Wanderlust, include 4×4-scarred Wadi Rum in Jordan and the tourist-eroded Inca site at Machu Picchu in Peru.